HomeNews‘Big Little Lies’ Season 2 Just Wrapped and the BTS Pictures are Fantastic! ‘Big Little Lies’ Season 2 Just Wrapped and the BTS Pictures are Fantastic! And that’s a wrap for the ladies of Monterey! 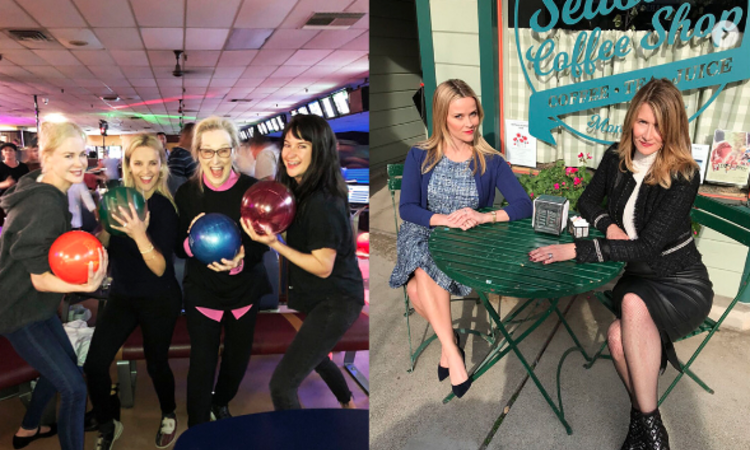 The Emmy-Award winning series Big Little Lies has officially wrapped production on its highly anticipated sophomore season and series star Reese Witherspoon celebrated with some great photos from the set! Witherspoon, who helped adapt the beloved Liane Moriarty novel for the small screen, commemorated the season’s end with an array of behind the scenes shots including some pics her fellow Monterey mammas Nicole Kidman, Shailene Woodley, Laura Dern and Zoe Kravitz. She also threw in a photo of the legendary Meryl Streep, who joined season two as Perry’s mother, and her TV daughter Kathryn Newton. Echoing Kidman’s sentiments we think that the most exciting aspect of season two will be Streep’s arrival. Seeing as the season one tackled the original source material, season two is heading into unknown waters and we can’t wait to see what her character has in store. Streep will be playing Mary-Louise Wright, the mother of Alexander Skarsgard’s season 1 character Perry, who comes to town to visit her grandsons and daughter-in-law (Kidman) following his death – and we think it’s safe to say that she will be coming with some questions as well. While we aren’t entirely sure what she knows about Perry’s abusive ways, the fact that she’s coming to town “looking for answers” does not bode well for Celeste and the other ladies involved in his murder. Kidman shared an exclusive look at Streep on set back in April. According to HBO, the second season of the series “will explore the malignancy of lies, the durability of friendships, the fragility of marriage and, of course, the vicious ferocity of sound parenting. Relationships will fray, loyalties will erode … the potential for emotional and bodily injury shall loom.” In addition to the core 5, season 2 will also find Adam Scott, Kathryn Newton, Iain Armitage, James Tupper, and Jeffrey Nordling reprising their season 1 characters. While HBO has yet to reveal a premiere date, they did reveal that the seven-episode season was set to air sometime in 2019.